Happy birthday Diane DeGroat (Roses Are Pink, Your Feet Really Stink) and Candace Fleming (Clever Jack Takes the Cake). It’s the birth date of Martha Alexander (A, You’re Adorable) and Elizabeth Foreman Lewis (1892-1958) Yong Fu of the Upper Yangtze. Best birthday wishes to singer Bob Dylan. Read Forever Young by Bob Dylan, illustrated by Paul Rogers, and Man Gave Names to All the Animals by Bob Dylan, illustrated by Jim Arnosky, and When Bob Met Woody: The Story of the Young Bob Dylan by Gary Golio, illustrated by Marc Burckhardt. In 1830, Mary Had a Little Lamb by Sarah Josepha Hale is first published. Read Thank You, Sarah: The Woman Who Saved Thanksgiving by Laurie Halse Anderson. Today has been designated Brother’s Day—a celebration of brotherhood for biological brothers, fraternity brothers, and brothers bonded by union affiliation or lifetime experience. As could be predicted, children’s books frequently focus on sibling relationships, both brothers and sisters. After all, in childhood these relationships loom large in our lives. 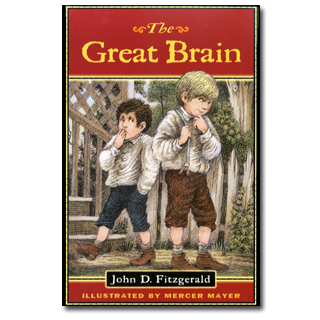 When I think of brothers in children’s books, to my mind the best series was published more than forty years ago, beginning with John D. Fitzgerald’s The Great Brain. In the 1950s Fitzgerald had written adult fiction, Uncle Will and the Fitzgerald Curse, Papa Married a Mormon, and Mama’s Boarding House. But then he began writing about the children of Adenville, Utah, at the turn of the twentieth century. For these eight novels, he drew loosely on his own childhood experience. In The Great Brain, narrated by young John Dennis Fitzgerald, we see his two older brothers through his eyes. Sweyn Dennis (all the boys have Dennis as a middle name) makes a cameo appearance. But Tom Dennis, aka the Great Brain, is the focus of the novel. For Tom is a smooth-talking, silver-tongued con artist—and loves to find any scheme that he can to relieve the children, and even parents, of Adenville, of their hard-earned money. Whether Tom is charging the children a penny to look at the family’s indoor water closet (the first indoor toilet in the neighborhood) or negotiating deals to breed John’s dog, he always finds a way to come out on top—usually at John’s expense. But Tom can also be compassionate. He helps a Greek immigrant assimilate into the community and shows a boy who has lost part of a leg how to recover emotionally and physically from his disability. The books bring to life the community of Adenville, Utah. Most people are Mormon, but some are Catholics and Protestants. Religious tension and conflict rarely get explored in children’s books, but the Great Brain books continually discuss this reality—even showing how religious prejudice brings about the death of an itinerant Jewish peddler. In the end, these books, ideal for seven- to ten-year-olds, celebrate brothers—caring, scraping, devoted brothers. So celebrate Brother’s Day by acknowledging the brothers in your life—and by picking up The Great Brain and its sequels. I followed Tom out to our backyard because I knew what he was going to do. His great brain had long ago figured out a way to eavesdrop on anybody in our parlor. We were without a doubt the best-informed kids in town on things parents didn’t want their children to hear. I watched Tom climb up to the roof of our back porch and then crawl up the edge of the roof until he was on top of the house. I held my breath as he stood up like a tightrope walker and walked across the pointed top of the roof until he came to the chimney for the fireplace in our parlor. He got hold of the top of the stone chimney and, using a crack for a footrest, hoisted himself up until his head was above the chimney. My brother had told me the stone chimney of the fireplace magnified voices in our parlor so he could hear every word spoken. Originally posted May 24, 2011. Updated for . I LOVED these books as a kid. I must have read “Me and My Little Brain” a hundred times, and made my dad track the last one down at the library because it hadn’t been repackaged along with the others. I was also kind of disappointed when I found out the author hadn’t actually lived in the period he wrote about, because the details of the book felt so real! I wish more of my students would read these books; I know my son enjoyed them. I always thought that they were so funny, and must have read them when they were fairly new! I haven’t read this series but remember hearing so much about it. I should check it out. I have to own up and say that I have never heard of these books. Must check them out. Good informativ post though. Sensational books! Perfectly illustrated by Mercer Mayer too! Trivia who starred in movie version? Oooooh – that passage you quoted is so exciting, I feel like a boy again! This is a series that I am itching to read to my girl and boy! Yesterday I ordered the first three books from the series! Can’t wait until they arrive. Thanks for reminding us – as always – about these unmissable gems from the past Anita! I look forward each day to checking to see what the “book of the day” is….this is a fantastic website. ooh, another gem to uncover. These are in the category of “not sure i’ve never read them.” And I’m thrilled to know there really is a “brother’s day” I celebrated it on twitter early, on the day before mother’s day this year. I always liked THE GREAT BRAIN and knew it was part of a series, but I didn’t know there were eight books. This is like eating the twelfth donut and then remembering you bought a baker’s dozen. Thanks for the sweet news. Our sixth grade teacher read aloud to us. At the time, we thought that was odd, since no one had done that in a while, but we loved it. She may have read more, but I remember specifically she read Tales of a Fourth Grade Nothing and The Great Brain. Both so funny, and appealed to both girls and boys. Good stuff. LOVED these books as a kid. The ingenuity of the stories was delightful — and the Americana of the setting made the books even more appealing … Like that other shyster Tom, young master Sawyer. And the characterization is very complicated. The clever, manipulative vacillations of Tom D. really draw in the reader, as well as the narrator … because we don’t know when we’re going to be knocked for a loop. We don’t know when it’s okay to be vulnerable. Just when we think he’s nothing but awful, he does something sweet. And just when it seems like he’s being a generous older brother, he screws us and John D. over. It’s that instability that keeps us guessing. The device of John D. being a younger brother — forever trying, with his “Little Brain,” to best his older brother — usually with disastrous results — works really well for kid readers. As a kid, you’re so used to people being more powerful, more clever, more knowledgeable than you are, and you want SO BADLY to be in control of something, that it’s incredibly involving to watch this kid brother try to get his own back. When he falls flat on his face, you’re hopping up and down and longing for another round of the fight. And when something does go well for him, it’s an amazing victory. These Fitzgerald books really are some of the great classics of lit for kids. And as Tom above comments, the ills. by Mercer Meyer don’t hurt! Thank you for talking these books up! I hope they’re never forgotten. Thanks everyone for the comments. It is always wonderful to find Great Brain fans. For those who haven’t read them, you are in for a treat. Mrs. D: Tom informs me that you are correct, the movie starred Jimmy Osmond. I loved these books when I was growing up! There was a movie??? How did I miss that?? Loved these books as a reader, and reading Tobin’s analysis of WHY they’re so involving, and thus memorable, makes me want to read them again as a writer. Thanks, Anita, and everyone in this community.